To help race fans get into the Halloween spirit, UPS Racing, Robert Yates Racing and Action Performance Companies Inc., the leader in the design, promotion, marketing and distribution of licensed motorsports merchandise, today unveiled a "monstrous" new race car – the No. 88 UPS/Universal Studios’ Monsters Ford Taurus – that Dale Jarrett will pilot during the NASCAR NEXTEL Cup Series race on Oct. 31, 2004 at Atlanta Motor Speedway. The UPS/Universal Studios’ Monsters Ford, also unveiled today on www.racing.ups.com, features classic characters of horror lore, including Dracula, The Mummy, The Wolf Man and Frankenstein, who adorns the car’s hood. The brown and orange car also is "stitched" together via a design that replicates Frankenstein’s famous sew marks. "Halloween is a fun time of year – something, I think, every family looks forward to," Jarrett said. "With this special paint scheme and with the race actually falling on October 31, it should certainly be a little more interesting than usual. Anytime you’re able to run a special paint scheme, the race becomes a little more exciting for the team and the fans. UPS has put together a good program with Action and Universal, and hopefully we’ll be able to put the UPS/Universal Studios’ Monsters Ford in victory lane." In addition to the UPS/Universal Studios’ Monsters Ford, Robert Yates Racing will also field a No. 38 M&M’S® Brand/Halloween Ford for the 500-mile NASCAR NEXTEL Cup race on Halloween. Both team cars will include a special "Team Halloween" logo designed by Action Performance. "Universal Studios’ Monsters are the most recognized characters in the horror genre, and Action Performance has been fortunate to showcase them in a variety of racing events over the last few seasons," noted Fred Wagenhals, Action’s chairman, president and CEO. "Now, the Monsters are teaming up with Dale Jarrett and UPS Racing for a Halloween race-day treat made for NASCAR fans. This October, look for Jarrett, UPS Racing and Universal Studios’ Monsters to scare up a win at Atlanta Motor Speedway." Action Performance will produce commemorative die-cast replicas of the No. 88 UPS/Universal Studios’ Monsters Ford Taurus in a variety of collector scales. The collectibles, as well as other Robert Yates Racing team memorabilia, will be available through Action’s usual distribution channels, including the 16-member Action Racing Collectables distributor network and the Racing Collectables Club of America. To locate an ARC distributor, please call 1-800-411-8404. To join RCCA, call 1-800-952-0708 or visit www.goracing.com. 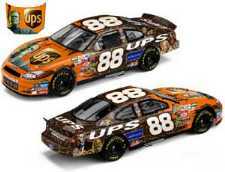 UPS has been the official express delivery company of NASCAR since 2000 and the primary sponsor of the No. 88 UPS Ford Taurus driven by Dale Jarrett for Robert Yates Racing since 2001. Building on the sport’s growing popularity and fan loyalty, UPS has been recognized for a strong marketing platform that links its services to the speed, precision and reliability of NASCAR® racing. UPS continues to build new business opportunities directly within the racing community, related automotive and supplier industries and with new revenues through licensed product merchandising. Visit www.racing.ups.com for more information about UPS Racing and the No. 88 team. Universal Pictures has created some of the most iconic characters in cinematic history, including Dracula, Frankenstein, The Mummy, The Wolf Man, The Creature From the Black Lagoon and The Phantom of the Opera. Universal Studios continues to honor the legacy of these classic films and characters with distinctive promotions, consumer products and themed entertainment. Only Universal Studios is the exclusive home of this immortal cast of original characters. Universal Studios Consumer Products Group is responsible for global licensing and retail strategies as well as building brand recognition of the extensive catalogue of NBC Universal properties. Universal Studios Consumer Products Group is a unit of NBC Universal, one of the world’s leading media and entertainment companies in the development, production and marketing of entertainment, news and information to a global audience. Formed in May 2004 through the combining of NBC and Vivendi Universal Entertainment, NBC Universal owns and operates the No. 1 television network, the fastest-growing Spanish-language network, a valuable portfolio of news and entertainment networks, a premier motion picture company, significant television production operations, a leading television stations group and world-renowned theme parks. NBC Universal is 80%-owned by General Electric, with 20% controlled by Vivendi Universal.